Provides a nearly endless spectrum of acoustic and electric tones. 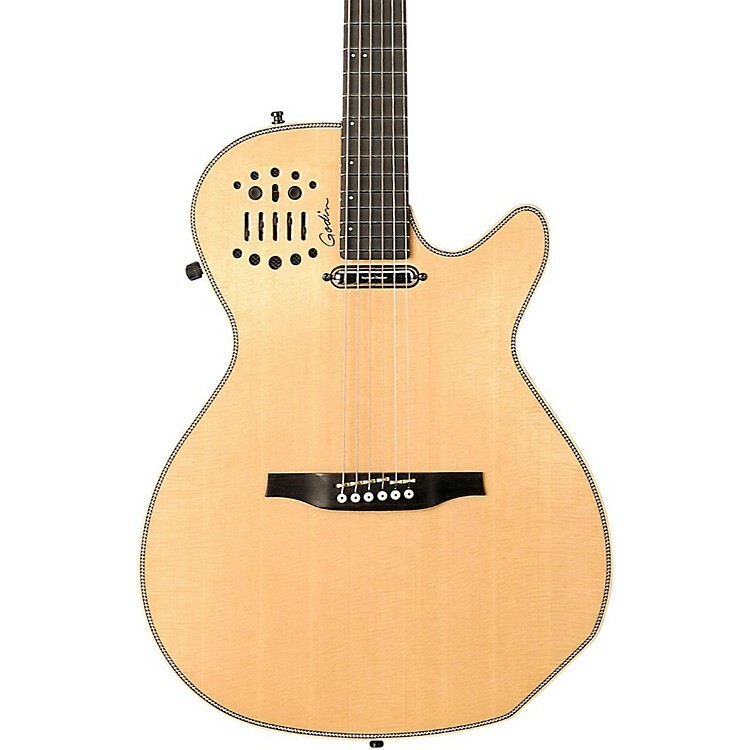 The Godin Multiac Spectrum SA is an acoustic-electric guitar with a wider body design, a Seymour Duncan Lipstick pickup in the neck, Custom Godin electronics with separate tone and volume controls for the Lipstick pickup, as well as a 13-pin connector for direct control of Roland GR Series and Axon AX100 guitar synths. The top of the steel string Multiac guitar incorporates a modern variation on the classic X-brace. The guitar's slim neck and shallow body make the Multiac Spectrum SA exceptionally comfortable to play. its 2-chamber body design resists feedback. The custom preamp on the Multiac Spectrum allows for onboard control of treble, mid, bass as well as a slider for synth volume and acoustic blend. Separate volume and tone controls for the Lipstick pickup can also be conveniently found on the side of the guitar. Godin Multiac guitars use the RMC Polydrive system which has individual transducer saddles under each string. This system not only produces superb amplified sound, but also produces a hexaphonic output through a 13-pin connector, which provides these guitars with direct access to Roland GR-Series synthesizers. A 1/4" phone output works with a regular guitar cord. The key to the exceptional synth tracking of the Multiac guitar lies not just in the electronics but also in the carefully selected and balanced blend of different woods used in its design. All of the materials are the result of extensive prototype testing to achieve the best possible combination of plugged-in guitar sound and synth tracking. It's the best of both the unplugged and plugged-in worlds. Order today.